COLLECTIVE EFFORT: Year 1 student Emily Andrews (facing camera) helps paint the mural with the Year 9/10 art class. 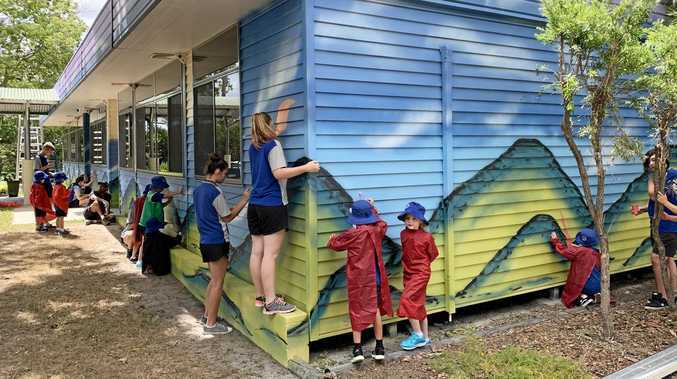 AN ART initiative at Miriam Vale State School is painting a picture of a colourful year ahead for students. The four-day mural project headed by indigenous artist Arthur Conlon started on the first day back at school and has coloured the front office with designs inspired by Aboriginal art. Mr Conlon said a valuable aspect of his work was involving students. "The most important thing is the kids working hands-on ... step by step they follow me,” Mr Conlon said. Originally from the South Burnett town Cherbourg, Mr Conlon said he got involved with Aboriginal art after leaving the military. The hobby eventually became a full-time job and he has now been painting murals across the country for 18 years. "Depending on how big the wall is I do different things. You can do both - Aboriginal art, non-Aboriginal art and mix them together,” he said. Last year Mr Conlon and Miriam Vale State School students created an ocean-inspired painting around the school swimming pool. He has undertaken multiple projects at the school over the past four years. Principal Hayden Ryan said the projects encouraged students to have a sense of ownership of the school. "Staff and P and C decided last year to invite Arthur back to the school, with feedback from parents overwhelmingly in support of having students contribute to another important legacy art project,” Mr Ryan said. "It was a timely initiative and an excellent environment for teachers to collaborate with their new classes in the first week of school.